1.10.10. Send regions, commands and buffer to M-x shell repl. 1.11.2. Compile a single c++ file related to current buffer and run it. 1.13.1. Get absolute path to current buffer's file. 1.15.12. Open directory at point with Microsoft Explorer in Windows OS. 1.23.4. Refresh / Revert buffer without confirmation. 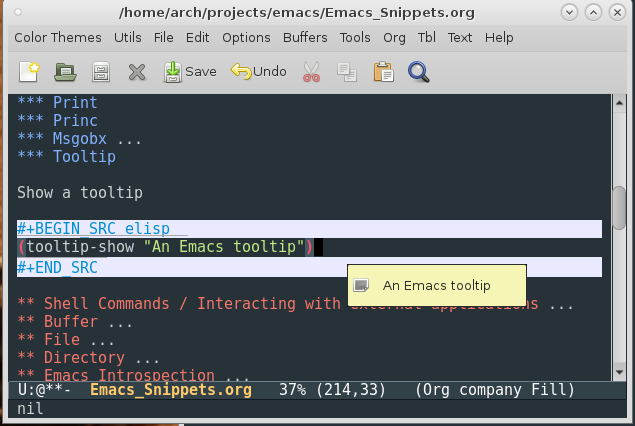 This section provides Elisp snippets and examples about Emacs API to help developers find what they need quickly. "Align region to colon (:) signs"
"Align region to comma signs"
"Align region to equal signs"
"Align region to hash ( => ) signs"
(mapc (lambda (p) (insert p) (insert "
"Copy a string to clipboard"
"Return the content of clipboard as string"
"Copied file path to clipboard"
Load an elisp source file *.el. Load an byte-compiled (*.elc) elisp file. It adds a directory containing Emacs packages (<package name>.el) to the load path. The user can load packages by adding the code (require '<package>) to the file init.el. This function switches and crates the scratch buffer if it doesn't exist or was deleted. Usage: M-x scratch. it if it doesn't exist. This function is useful to Elisp developers. Add (defalias 's #'scratch) to the init file. It only works on Linux and requires Xclip to be installed, but with a few changes can be tweaked to work in another Os. "** sample-function (a b c)\nFunction Docstring\n\n#+BEGIN_SRC emacs-lisp\n(lambda (a b c) \"Function Docstring\" (+ a (* 5 b) (* 3 c)))\n#+END_SRC\n"
"Tests if all values of bool-list are true (not nil)"
"Tests if at least one value bool-list is true (not nil)"
Returns the content of a buffer referencend by its name or the buffer object. Returns the selected text of the current buffer. It can be easily changed to work with other languages like ruby by replacing python-mode to ruby-mode. ;; Creates a new buffer object. Get all local variables of a buffer. Function append to file: Append buffer's region content to file. Append current buffer content to file. If the file doesn't exist, it will be created. Otherwise the buffer content will be appended to the end of the file. Append a specific buffer content to file. ;; Delete file if exists in order to overwrite it. ;; Append buffer content to file. read-shell-command Read a shell command. read-command Read an M-x elisp command returning a symbol. read-key Read a key from the keyboard. read-key-sequence Read a sequence of keystrokes and return as a string or vector. read-regexp Read regular expression returning it as string. "user enter some string in minibuffer"
Reads a file name from the user and gives auto completion. Enter tab to autocomplete the file name. 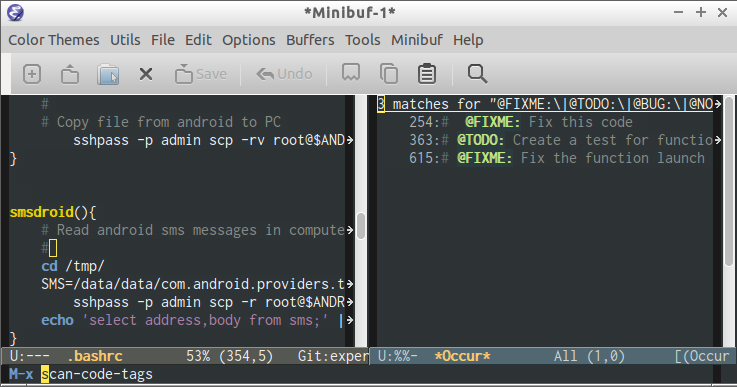 Opens a prompt that asks for the path in the minibuffer with completion and inserts the path at the current point. In order to Emacs find where applications such as ruby shell, scala compiler and tools are installed it is necessary to the PATH environment variable contain the path to the directories which contains those applications. Copy this command below to the scratch buffer and enter M-x eval-print-last-last-sexp. ;; and (:) for Unix-like systems. Note: The character ':' is the separator for Unix-like OS (Linux/ BSD and OSX) and ';' is the separator for Windows. Figure 4: Scala in PATH variable. Use the function locally without pollute the namespace. Display PCI cards in another frame. 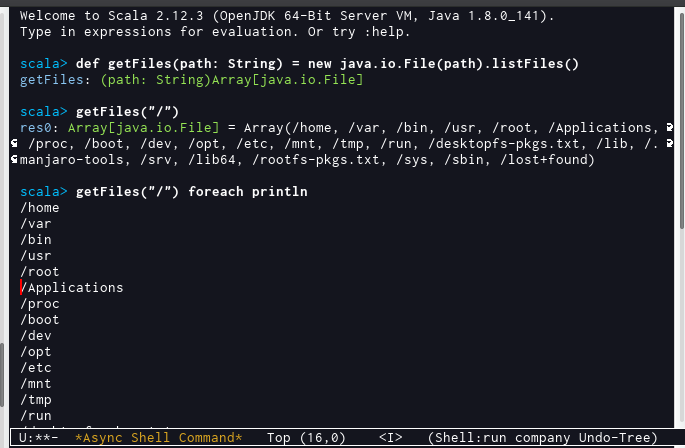 The function shell-command-to-lines runs a shell command and returns the output lines. This function is useful to create shell command wrappers over Unix shell commands like find. (format "find %s -name '%s'"
Pipes the buffer content to external command and print the output in the buffer *Shell Command Output*. The command $ wc -l counts the number of line of the current file. Pipes the buffer content to external command $wc -l and get the output as a string. The command below will pipe the buffer *scratch* to the command =$ sed 's/foo. */bar/g'= which replaces all values of foo for bar. Usage: M-x shell-command-on-buffer Enter: sed 's/defun/defn/g' eplaces all defun words by defn. "Apply a shell command in the current buffer and replace it by the command output. - Interactive usage:  M-x shell-command-on-buffer Enter: sed 's/defun/defn/g'. replaces all defun words by defn. This function applies a ruby batch command on the buffer. Example: The command will number each line of the current buffer. 2. type: 'printf(\"%6s%s\", $., $_)' without quotes." Emacs regexp islimited and doesn't have lookahead like perl or ruby regex. This command can extend the functionality of Emacs regex using ruby. This function applies a ruby regex on the buffer. "Applies ruby regex, the command $ ruby -pe 'gsub(regexp)' on the current buffer. Example: The Command replace all occurrences  of 'defun' by 'defn'. Refactoring to a self-contained-code, removing all dependencies. "Replace ruby-gsub on buffer same as replace-regexp, but with ruby regex. Example: The Command replace all occurrences of 'defun' by 'defn'. 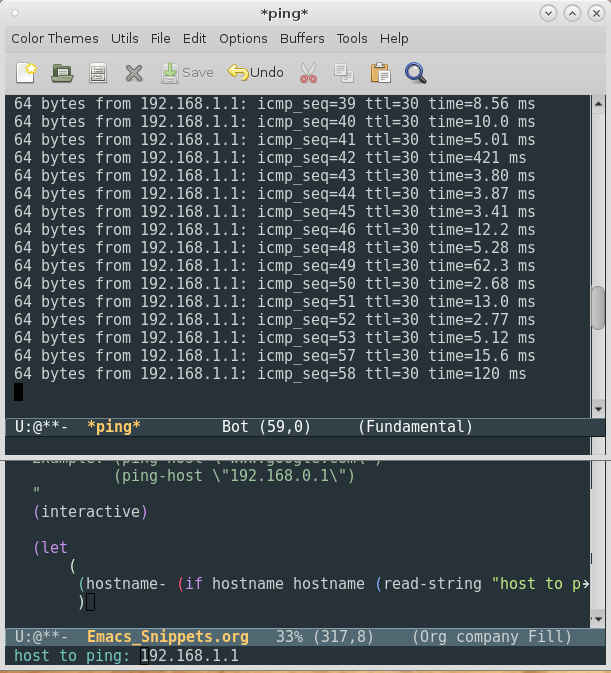 "Run traceroute command to test connection. 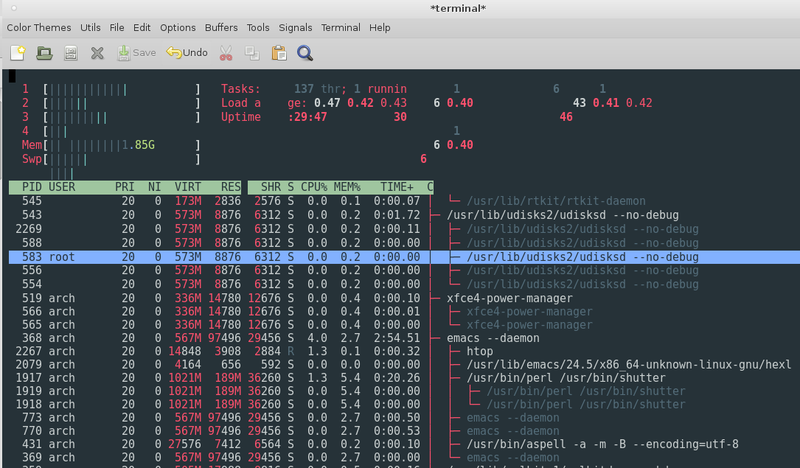 Some Linux ncurses-based applications like Htop, Top, Nmtui (Network Manager's terminal UI) doesn't work well running in Emacs terminal emulator M-x term or M-x ansi-term. The solution is run the command from Emacs and send to an external terminal emulator. This command uses xfce4-terminal but it can be changed to any other terminal emulator. 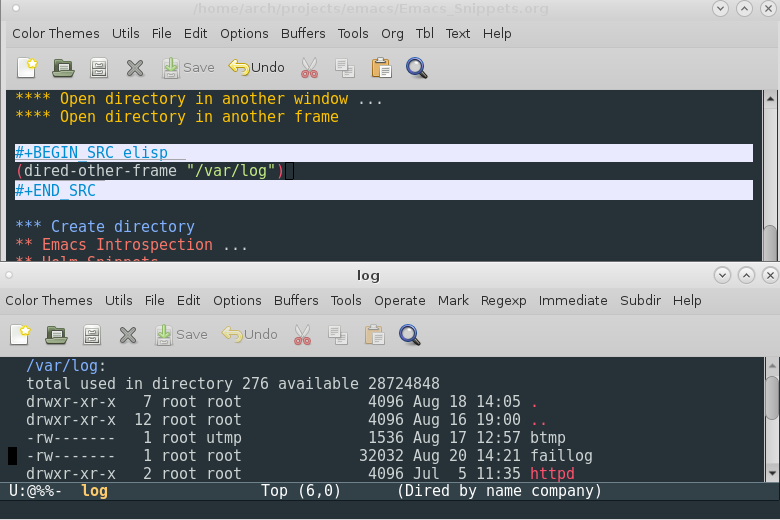 "Launch application in a terminal emulator." ;; Change this for your terminal. Command M-x htop to launch htop. This command asks the user a shell command providing tab completion and launches an asynchronous process (it doesn't freeze Emacs). Unlike asynchronous-shell-command this command doesn't create a new buffer. It is useful to launch desktop GUI applications from Emacs like Firefox, terminal emulator, file mangers and so on. Note: In order to this command find the app the directory of the app must be in the $PATH variable. "Launch a process without creating a buffer. 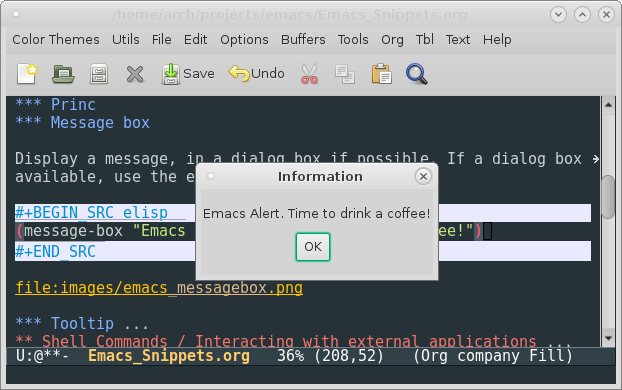 It is useful to launch apps from Emacs." This comamnd can be bound to a keybiding with the code bellow that bidns the key combination SUPER (Windows Key) + 8. 1.10.10 Send regions, commands and buffer to M-x shell repl. M-x shell/buffer-repl This command deletes all other windows and splits the current frame into two windows one containing a M-x shell (bash) repl and the other a shell-script scratch buffer (sh-mode). M-x shell/buffer-repl-frame Like the shell/buffer-repl, but shell and the scratch buffer are displayed in new frame. This functions are useful to send regions, lines and regions to M-x shell repl from a shell-buffer or shell scratch buffer to the repl. "Send selected text to M-x shell repl." "Insert selected text into M-x shell repl and run it." "Send current line to M-x shell repl." "Insert current line to M-x shell repl." "Execute current line as shell command." "Execute current region as shell command." "Insert all buffer content into M-x shell repl and run it." User runs M-x shell/buffer-repl-frame. It will open a frame like in the picture bellow. User select the region with some code and runs M-x shell/insert-region. It will send the current region to the shell repl and display the output, in this case the content of root directory. 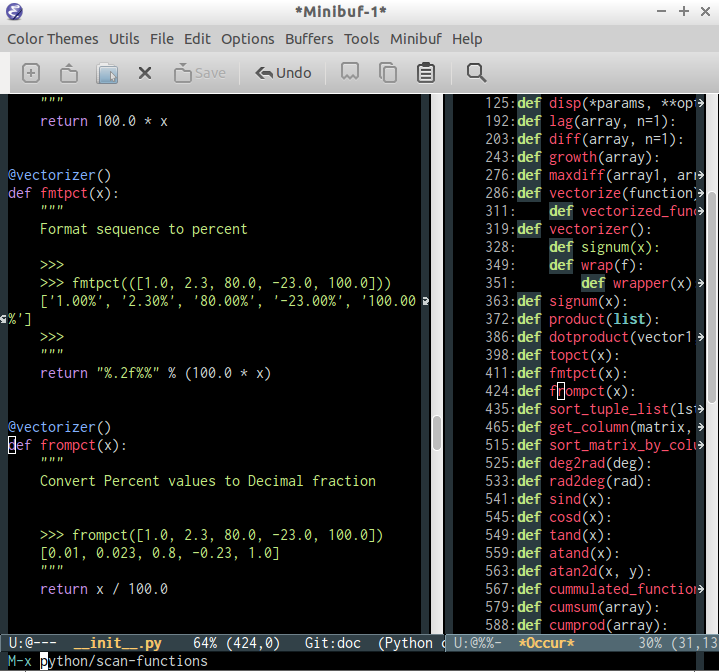 Figure 13: Example of M-x shell/buffer-repl-frame. This command is similar to emacs M-x compile, however it expands '%f' to the buffer file name, '%n' to buffer base name and '%d' to buffer directory. Example: if the current buffer is associated to the file /home/arch/scripts/gui1.scala and the user types the command M-x compile2 followed by the command below. The advantage of this command is that user doesn't need to type the file name to be compiled. - %f - is expanded to current buffer file name. - %d - is expanded to current buffer current directory. - %n - is expanded to current buffer base name. Example: if the current buffer is associated to the file. $ scalac gui1.scala -d app-gui1.jar && scala scala app-gui1.jar"
1.11.2 Compile a single c++ file related to current buffer and run it. Usage: When the user run the command M-x cpp/compile-run-buffer at the current buffer (file code1.cpp) it will compile and run this file running the command $ g++ code1.cpp -o code1.bin && ./code1.bin. "Compile and run current c++ buffer (single-file C++ code). will run $ g++ code1.cpp -o code1.bin && ./code1.bin"
(compile (format "g++ %s -o %s && ./%s"
Usage: In dired mode mode, place the cursor at the file to be compiled and run M-x cpp/compile-run-dired. "Compile single c++ file at point in dired mode. 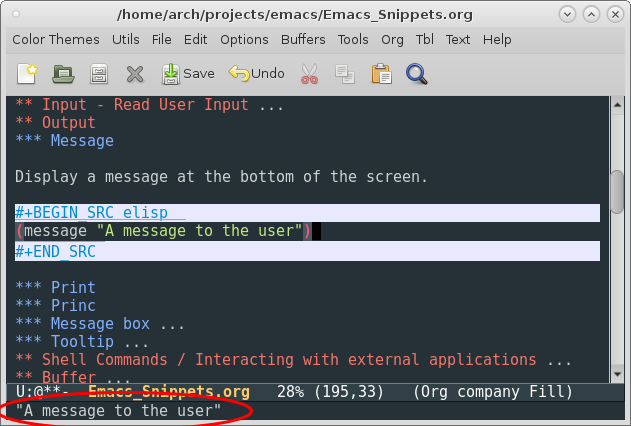 The Emacs API doesn't provide a straightforward way to read file directly to a string. The only way to perform this taks is using a temporary buffer. "#\n# /etc/host.conf\n#\n\norder hosts,bind\nmulti on\n\n# End of file\n"
Emacs Documentation: Read file FILENAME into a buffer and return the buffer.If a buffer exists visiting FILENAME, return that one, but verify that the file has not changed since visited or saved. The buffer is not selected, just returned to the caller. 1.13.1 Get absolute path to current buffer's file. Transform file name to name without path and extension. Get the directory that contais a file. Example: It will replace the extension of file name init.el to init.py. Note: it will not modify the file. Print the directory content in elisp shell IEML. Get directory content with absolute file name. The dired mode is the mode used by Emacs to browser directories. See also: How do you customize dired? Copy path of file at point. "In dired, copy file path to kill-buffer. At 2nd time it copy current directory to kill-buffer." This command pastes a file which path is stored in clibpoard. 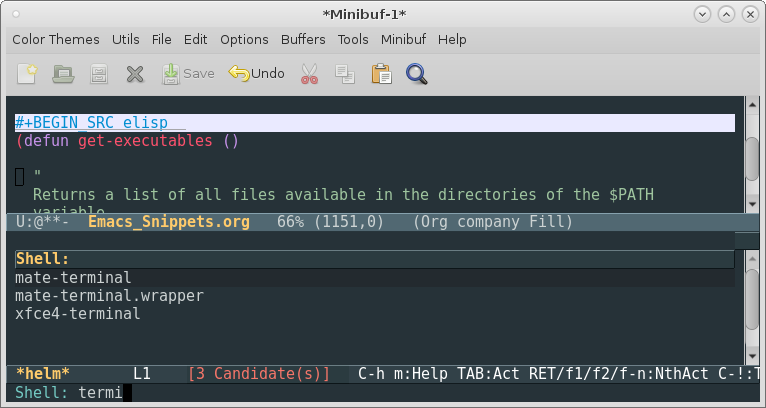 Copy file from clibpoard with Emacs or from system's default file manager. "Paste a file from clpboard to current directory." Create empty file at current directory opened in dired mode. "Creates empty file at current directory." 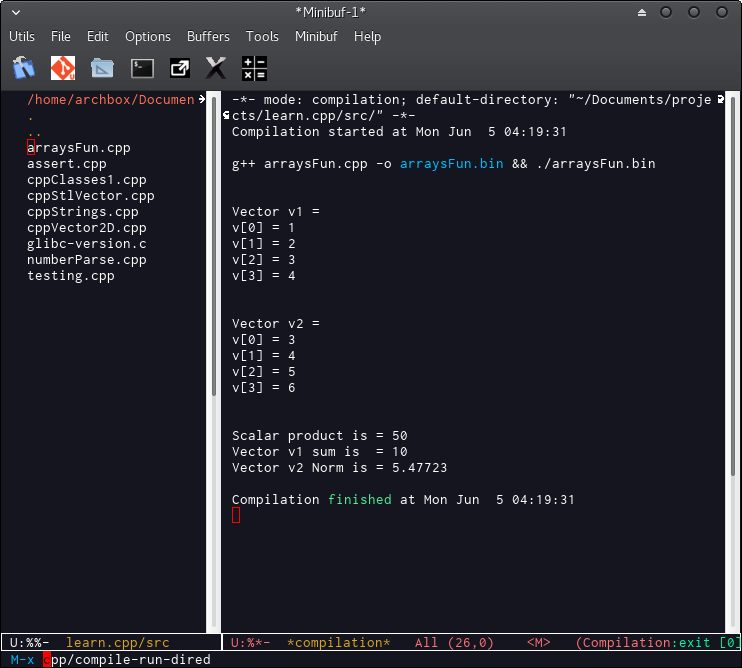 "Open all marked files in dired mode with m.
Function: xdg-open. Open any file with system's default application. "Open a file FILENAME with default system application. This function is operating system independent." "Open file at point with systems' default app. to execute the file with the system default app. The function M-x dired-bookmarks opens a helm menu where the user can select its favorites directories. It provides quick directory navigation. "Open a directory by selecting it in Helm menu." It will only show files matching this extensions. To view all files type g.
"Filter dired buffer by file extensions. It will only show files ending with extensions *.exe and *.dll. To show all files of dired buffer again type 'g'." This command only displays files matching the given regex (Emacs' regex). Example: By entering M-x dired/filter '\.pdf$' without quotes it will only show file names ending with .pdf. To display all files again type 'g'. "Show only files which name matches a regex." 1.15.12 Open directory at point with Microsoft Explorer in Windows OS. "Sat Jul 15 04:26:27 2017"
The variable window-system is the name of window system through which the selected frame is displayed. 'pc' for a direct-write MS-DOS frame. "Running in Window System / GUI"
"Open the web site http://www.yandex.com." It opens the web site: https://www.gnu.org/software/emacs/manual"
Emacs Provides a built-in lightweight web browser eww browser that can be used to quick access web sites in terminal or Emacs GUI. It is useful to view html documentation inside Emacs. http://www.google.ca/m?q=<query> - Country/Culture insensitive search, always English. This function downloads a file from the url copied to clipboard and then asks the user to which file the data will be downloaded suggesting the file name extracted from the url. This function updates the current buffer (revert buffer) if executed in a dired buffer (directory). 3. View file in current directory. C-x d to open it. "Download a file from a URL in the clibpoard. to be downloaded suggesting the file name extracted from the url. This command reads an url from the user and download the file content and displays it on a buffer without write a file to disk. It will suggest in a prompt the former url. User hit return. User enter the command. M-x csharp-mode that turns on the syntax hightlight. "Download a source code from url and displays it on a buffer." "Send ARGS to URL as a POST request." "Send ARGS to URL as a GET request." If the package is installed returns t (true) and nil otherwise. This command install a single-file elisp package from a given URL to source file. 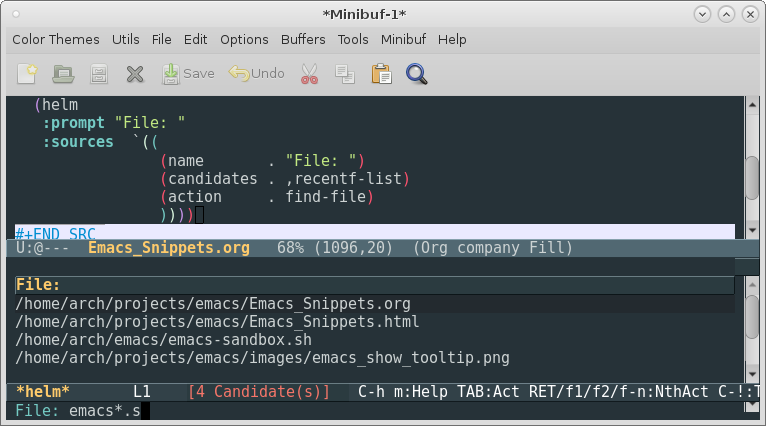 Copy the url of the package file to be installed like http://mumble.net/~campbell/emacs/paredit-beta.el from EmacsWiki:Par Edit. Type M-x package-install-url It will ask to confirm the URL. Then type return and the package will be installed. To find where the package was intalled type M-x find-library <library-name>. "Install a single-file package *.el file from Url." This command switches between buffer with files that are in current directory. "Check if a buffer has file associated and is is in DIRECTORY. - buf        buffer object  - buffer object"
"Switch between buffers in same directory." (x y a b 21 10)." This piece of code gets all executables in the $PATH variable and searche for one that matches the user input and then launches it. It is useful to launch applications without block Emacs. "Returns a list of all files available in the directories of the $PATH variable." "Run a shell command in asynchronous mode. It doesn't block Emacs while the command is running. M-x run-async  -> User enters a command." "Run a shell command in asynchronus mode, not blocking Emacs. 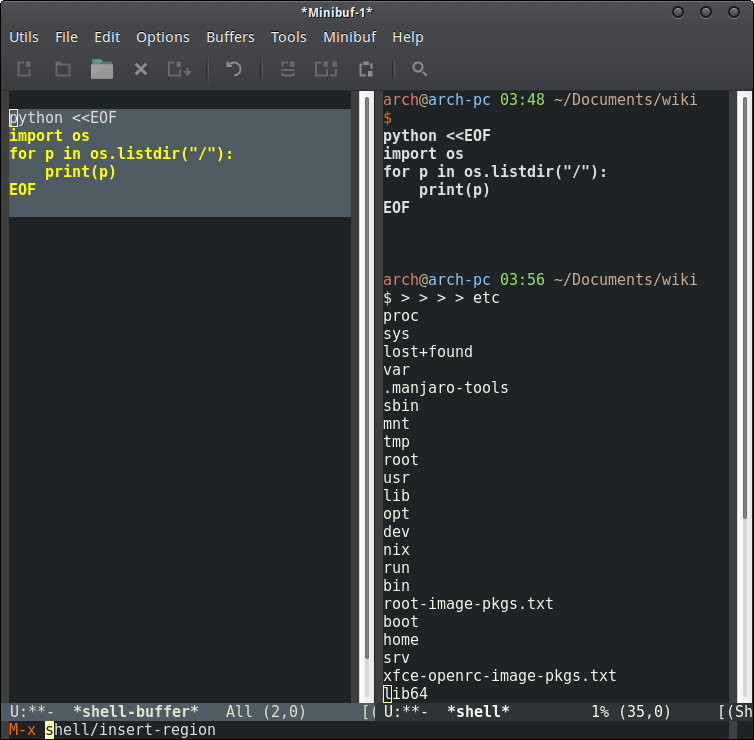 Example:  > (run-async \"thunar\" \"/usr/share/applications\")"
"Launches apps available in $PATH without blocking Emacs. Switch between buffers associated with files. "Switch between buffers that are associated with files. "Switch between all major programming modes available in Emacs. This command extracts the build tasks from a Makefile and shows it as a helm menu where the user can select the task to be executed. It will be run as a asynchronous process. "Get a list of all regexp matches in a string"
Example: Assuming that the current directory has the Makefile with content. The command M-x helm-make will show the tasks all, html, browse and clean. Press <F7> to save the curren window configuration and <F8> to restore. The functions can also be executed with A-x save-view or A-x restore-view. 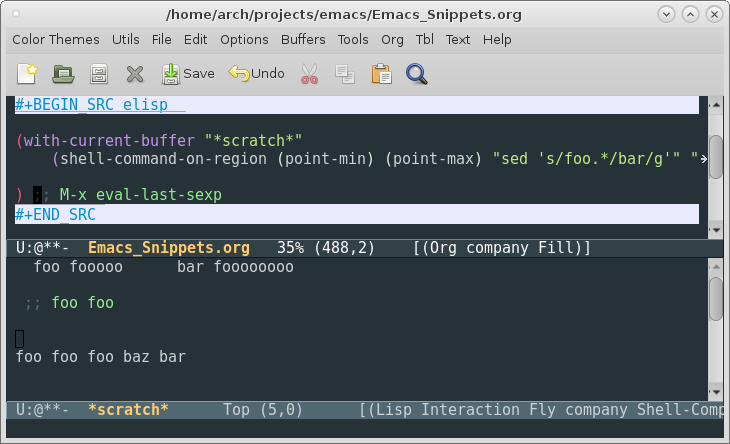 Saves the scratch buffer to a file every times Emacs is closed. The function occur is useful for code navigation and scan code statements, this function is invoked by M-x occur. The function python/scan-functions will scan for all lines that starts with def statement in a Python code and show the matching lines in the right side. "Scan code tags: @TODO: , @FIXME:, @BUG:, @NOTE:." It is useful to quick edit and reload ~/emacs.d/init.el without restart emacs. Those functions can be put in the init.el file. 1.23.4 Refresh / Revert buffer without confirmation. Copy and paste the code below to the scratch buffer and enter M-x eval-buffer. This code can also be put in ~/emacs.d/init.el, in the config file. 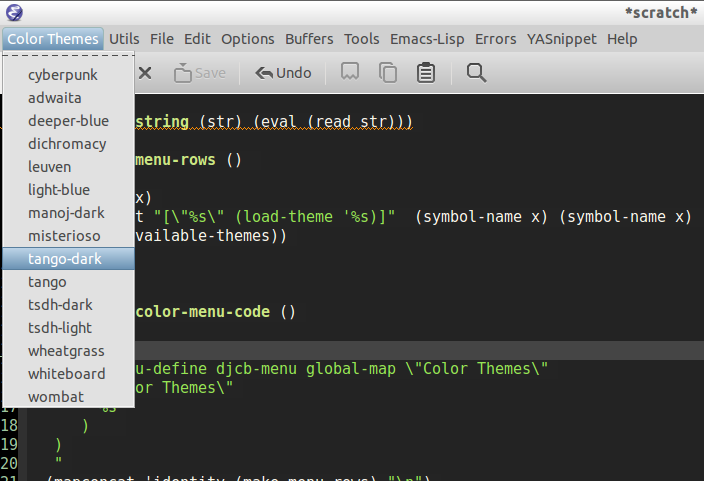 (easy-menu-define djcb-menu global-map \"Color Themes\"
;; way to write it is to use Elisp macros. ;; @DONE: Change eval-string to an Elisp macro. ELISP> `(easy-menu-define djcb-menu global-map "Color Themes"
(easy-menu-define djcb-menu global-map "Color Themes"
;;; Now execute the generated code, the menu will pop up. ELISP> (eval `(easy-menu-define djcb-menu global-map "Color Themes"
`(easy-menu-define djcb-menu global-map "Color Themes"
(easy-menu-do-define 'djcb-menu global-map "Color Themes"
Change the default IELM prompt "ELISP> " to "> ". Send selected text (region) to IELM and print the output. "Select other window' buffer as IELM's working buffer." This command starts IELM in other window setting the working buffer to current buffer. It allows the user to manipulate the current buffer. "Start IELM in other window with current buffer set to current windows' buffer." "Launch IELM in other frame." dvnmk/process - Play youtube playlist using Emacs + mpv player. TikhonJelvis/epage - "A little pager script I wrote that calls out to emacsclient."